Indeed, beyond the strong political ties binding Morocco to most African countries, the Kingdom has not waited for the world economic powers to look towards Africa to show interest in the continent and spearhead mutually advantageous south-south cooperation. Having realized years ago that the genuine growth of its economy has to be sought southward, Morocco has multiplied initiatives to boost its economic relations with its southern partners. Therefore, Morocco’s choice of the southward path is quite natural, given its centuries old historical, cultural, and economic ties with the African continent. Indeed, Morocco has always had a strong presence across Africa and has played a key role in fostering trans-Saharan trade, which dates back to the 9th century BC and which reached its peak between the 13th and 16th centuries, laying a bridge between the mainland and the rest of the continent. Today, centuries later, this bridge is still crossed by several Moroccan institutions and firms which do not hesitate to invest in African countries, to do business and at the same time to contribute to the socio-economic development of the continent and to promote transfer of expertise and know-how, making every effort to recognize local talents. These firms find incentives in the personal commitment of Morocco’s King Mohammed VI who endeavours ceaselessly to consolidate his country’s bilateral relations with the rest of Africa and to boost south-south cooperation. Since his coming to power in 1999, the King has made of Africa one of his strategic choices, as evidenced by the number of African tours he conducted and the number of African heads of State he hosted in Morocco. 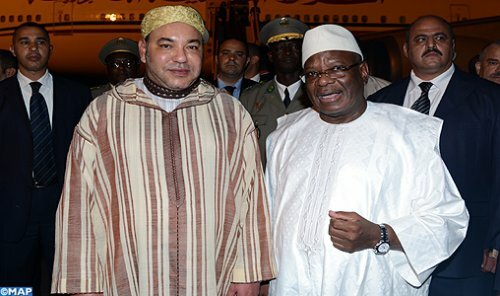 Later last week, the King of Morocco attended personally in Bamako the swearing in ceremony of the newly elected President of Mali, Ibrahim Boubacar Keita (IBK), to renew, if need be, Morocco’s commitment to a unified, stable Mali. Besides, part of its humanitarian assistance to the Malian people, Morocco set up a few days ago a field military hospital in Bamako that provides medical care in different specialties. Morocco’s commitment towards Africa is also translated by the financial and humanitarian assistance the country provides whenever an African country is facing difficulties, social upheavals or natural hazards. The King has actually been a driving force in the continental bid to establish a new and modern process of inter-African development and has always shown a constant, keen interest in bolstering Morocco’s relations and cooperation with other African nations. Given the personal involvement of the Head of state, it is therefore hardly surprising to see Moroccan companies choosing Africa first when they go international. Thus, many Moroccan large firms, including Banks (BMCE, Attijariwafa Bank, Banque Populaire,) real estate developers (Addoha, Alliances Développement Immobilier,) insurance companies (Saham Group), mining and industrial companies (Managem group & OCP) and telecom companies (Maroc Telecom) are currently operating in some 23 African countries, with focus on the members states of the Economic Community Of West African States (ECOWAS.) Over the 2006-2012 period, about 40% of Morocco’s direct investment went to Africa and Moroccan operators participated in huge projects in the sectors of low-cost housing, civil engineering, water quality, transport etc. The returns of the telecom sector alone have recorded a 12% increase thanks to its sub-Saharan branches (Gabon, Burkina Faso, Mali, Mauritania) and the Moroccan carrier RAM is servicing 26 African countries from the Casablanca hub. However, whatever strong Morocco’s ambition can be and whatever bright the investment and business prospects in Sub-Saharan Africa can be, the Kingdom’s anchorage to the continent is affected by the fragmentation of markets and the weak integration of the continent on the economic scale. Many observers believe that regional integration is a crucial economic necessity for the development of a continent, which remains fragmented. Intra-African trade, for instance, does not exceed the level of 11% while intra-Asian trade stands at 27%. Whereas the huge cost of non-integration for African economies is assessed at around 1 to 3% of GDP, integration is a critical leverage for economic growth. It goes without saying that a comprehensive integration is a long, arduous process. In order to move forward, African countries need to begin with the most feasible form of integration, which is also the most optimal in terms of cost, benefit, and time: financial convergence. It can be achieved mostly through increased cooperation, better rules, mutual concessions, and minor investments, knowing that deep and well-functioning financial systems contribute to providing access to cheaper and longer-term capital that companies need to sustain their growth. Moreover, efficient capital markets that are less fragmented will allow Africa to capture a larger share of international capital, ensure better allocation of funds, improve corporate governance through higher transparency, and facilitate regional cross-border investment and operations through enhanced regional investment climate. African governments need also to work together to reduce the administrative burden for regional companies and to facilitate cross-border flows through bilateral treaties. This is a crucial prerequisite to attract more international investors and companies looking at investing their extra liquidities in the region. Morocco has already grasped the strategic, economic and commercial importance of the continent. The Kingdom is strongly committed to work with all regional actors in order to facilitate the political and economical transitions Africa is witnessing. A first major step has been accomplished in Mali, but the second step will need everybody’s implication in order to achieve a true financial integration of the continent, source for future common prosperity. Said Ibrahimi is the Chairman of Casablanca Finance City, the African financial hub of Morocco, and the former treasury general of the Kingdom.